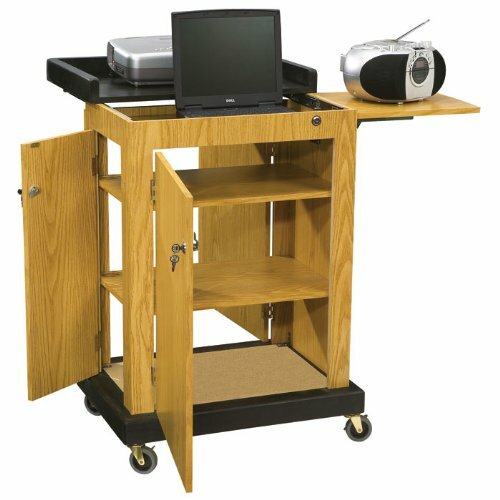 Our computer friendly lectern is a multipurpose computer lectern cart featuring a 2" deep area for a laptop that locks with a slide out locking shelf for projectors and multimedia equipment. Three locking doors provide secure storage on three inner shelves for equipment and A/V material. Wire management grommets are strategically fixed inside the unit for laptop, LCD projector, and accessory equipment use. This cart is constructed from high quality MDF core with a stained pine wood finish on the base. This unit rolls on four 4" easy roll casters, with two locking. Measures 28" width by 41" height by 21" depth. Mahogany color. If you have any questions about this product by Oklahoma Sound, contact us by completing and submitting the form below. If you are looking for a specif part number, please include it with your message.